Two addons are contained in this article and both are decorative. Now many players are trying to do something unusual and interesting, aimed at decorating your buildings. These addons can slightly transform your house with new statues and heads. The addons are based on replacing the same items, so each addon can only work separately from the other. 1. These statues are made in the form of mobs, or rather they are standard models of creatures. They can be attached to the wall or put on the floor, in any case the statues will stand still. The addon does not allow to put armor on these models or to make any other actions. 2. The second addon replaces the vanilla heads with Steve's heads. In total, there are 5 variants, each has a certain object (glasses, hat, ears, etc.). 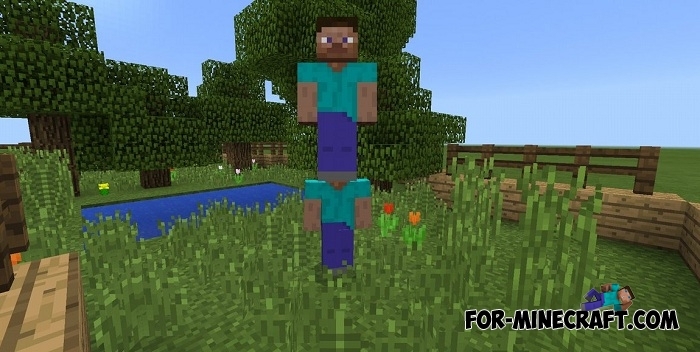 In fact, these are super simple addons and they do not add any new features but there is a very important advantage: you can replace statues and heads with your own ones, just add a new skin to the folder (textures/entity/skulls) and new items will appear in Minecraft Bedrock Engine (PE).